Ovarian cancer is the fifth leading cause of cancer deaths in women worldwide. LncRNACCAT1 was reported to play a critical role in cell metastasis of ovarian cancer. However, little is known about the detailed mechanism of how CCAT1 enhances TGFβ1-induced EMT of ovarian cancer cells. We used RT-qPCR to examine the level of miR-490-3p and CCAT1 and western blot to detect the protein level of TGFβR1 and EMT-associated markers. We utilized luciferase reporter assay to confirm the direct interaction of CCAT1 or TGFβ1 with miR-490-3p. Wound healing and invasion assay were employed to investigate the role of CCAT1 and miR-490-3p in the TGFβ1-induced migration and cell invasion of ovarian cancer cells, respectively. TGFβ1 stimulated the expression of CCAT1. And CCAT1 knockdown decreased cell migration, invasion and EMT-associated markers expression of ovarian cancer cells treated with TGFβ1. CCAT1 directly targeted and downregulated miR-490-3p, then increasing TGFβR1 level. miR-490-3p was shown to regulate cell invasion, migration and EMT markers expression via TGFβR1. In addition, we also observed that miR-490-3p was essential for TGFβ1-induced tumor cell invasion and migration influenced by CCAT1. CCAT1 level was significantly higher in tumors than adjacent normal tissue, in contrast, miR-490-3p level was lower in ovarian tumors. Here, we reveal that CCAT1 contributes to TGFβ1-induced EMT of ovarian tumor cells through miR-490-3p/TGFR1 axis. 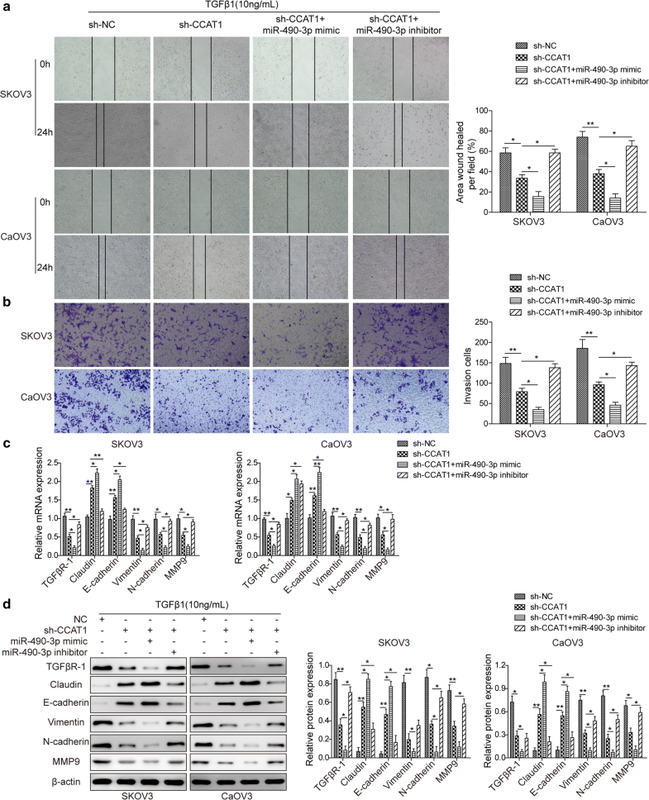 These findings will provide deep insights into the mechanism by which CCAT1 exerts its oncogenic role in ovarian cancer progression and facilitate developing novel therapeutical therapies for treating ovarian cancer. Ovarian cancer is one of the most lethal cancers and the fifth leading cause of cancer-associated death. However, little improvement of survival rate has been achieved over the past decade [1–3]. Patients diagnosed and treated with early stages have a 5-year survival rate over 90%. Unfortunately, the vast majority of ovarian cancer patients are diagnosed with advanced disease and 5-year survival is less than 30% . Hence, the comprehensive understanding of the molecular mechanism of ovarian cancer metastasis is a key issue. Epithelial–mesenchymal transition (EMT) is a developmental process whereby epithelial cells reprogram to a mesenchymal-like phenotype. Tumor cells undergo EMT change, a key prerequisite for metastasis, which can be initiated or controlled by various intracellular signaling pathway in response to environmental cues, including transforming growth factor beta1(TGFβ1) signaling [5, 6]. On one hand, TGFβ1 directly induces expression of EMT transcription factors, such as Snail, Slug, zinc finger E-box-binding homeobox1/2(ZEB1/2) and Twist, through Smad pathway [7, 8]. One the other hand, TGFβ1 promotes EMT via activation of PI3K/Akt/mTOR or mitogen-activated protein kinase (MAPK) pathway [9, 10]. Several studies suggest that the TGFβ1 is involved in ovarian cancer EMT progression. For example, it was report that TGFβ1 was upregulated in ovarian CAF-derived exosomes, which enhanced migration and invasion ability and the promotion of EMT by activating the SMAD signaling pathway . 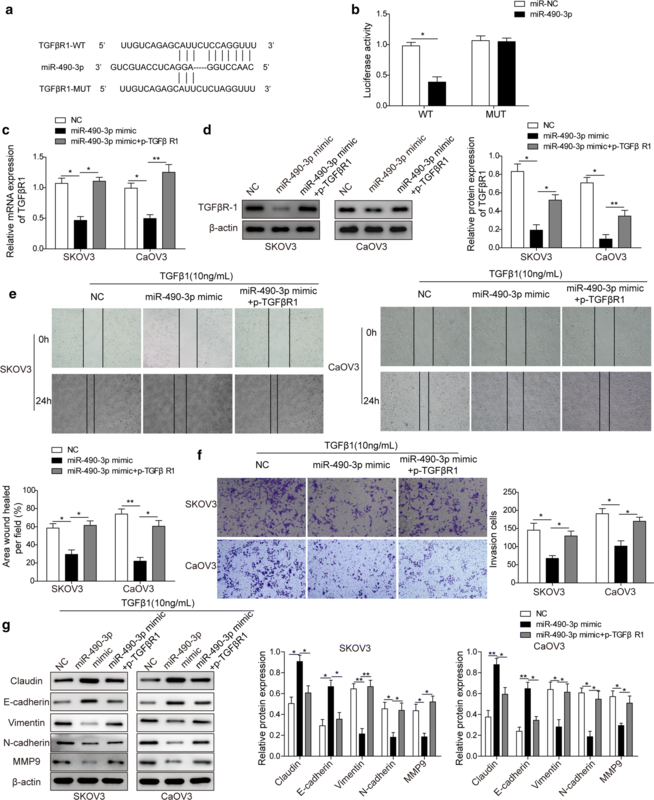 Inhibitor of DNA binding 1 (Id-1), a protein repressed by miR-29b, facilitates the TGFβ1-induced EMT in human ovarian cancer cells . However, little is known about the detailed mechanism of how TGFβ1 induces EMT of ovarian cancer cells. Long ncRNAs, defined as a form of ncRNAs greater than 200 nt in length, are found to exert their gene transcription regulatory function by epigenetic regulatory mechanism [13–15]. Colon cancer-associated transcript 1 (CCAT1), ~ 2-kb lncRNA located at chromosome 8q24.21, is first found to be upregulated in colon cancer . Recently, CCAT1 has been reported to be involved in a variety of cancers, including hepatocellular carcinoma , gallbladder cancer , gastric cancer  and colorectal cancer . Yuan Cao et al. showed that CCAT1 downregulation inhibited epithelial ovarian cancer cell EMT, migration and invasion through targeting miR-152 and miR-130b . However, whether CCAT1 is implicated in TGFβ1-induced EMT of ovarian tumor cells remains unclear. Based on the above facts, we sought to clarify the mechanism by which CCAT1 promoted TGFβ1-induced EMT of ovarian cancer cells. Over the past decades, microRNAs have been considered to modulate their target genes expression by binding the 3′-UTR of targeted genes. Pathologically, microRNAs are involved in a wide range of cancer cell phenotypes, such as cell proliferation, survival, invasion and EMT [22, 23]. For examples, aberrant expression of miR-200 family is strongly associated with pathologic EMT . MiR-451 regulates migration of glioma cells through AMPK and mTOR signaling . In bladder cancer, miR-148a suppresses EMT by establishing links between ERBB3/AKT2/c-myc and DNMT1 . Recently, several studies have showed that miR-490-3p has an inhibitory role in EMT of hepatocellular carcinoma and colorectal cancer cells [27, 28]. Intriguingly, miR-490-3p inhibits colorectal cancer metastasis by targeting TGFβR1, a TGFβ1 cognate receptor . Moreover, it was report that lncRNACCAT1 regulated gastric cancer cell migration by targeting miR-490-3p . Besides, MiR-490-3p plays a tumour suppressor role in epithelial ovarian cancer,and overexpression of miR-490-3p was reported to promote G1/S arrest and apoptosis, reduce cell proliferation and invasion of ovarian cancer cells . It remains unknown about whether CCAT1 regulates TGFβ1-induced EMT of ovarian tumor cells through miR490-3p. In this study, we highlight that knockdown CCAT1 represses TGFβ1-induced EMT of ovarian cancer cells through miR-490-3p/TGFβR1 axis. These findings will provide more understanding of how CCAT1 contributes to ovarian cancer metastasis, which helps develop novel targeted drugs for treating ovarian cancer. Ovarian cancer cells (SKOV3 and CaOV3) and 293T cell were purchased from ATCC and cultured in Dulbecco’s Modified Eagle’s Medium (DMEM, Hyclone) supplemented with 10% fetal bovine serum and 100 U/ml penicillin/streptomycin at 37 °C, 5% CO2. TGFβ1 was purchased from R and D systems and was used to induce EMT in SKOV3 and CaOV3 (10 ng/ml) cells for the indicated time periods. A cohort of 25 ovarian tumor tissues and adjacent normal ovarian tissue samples were obtained from patients aged 25–55 undergoing wedge biopsy of the ovaries or adnexectomy due to myoma or adenomyosis, between 2016.6 and 2017.5. No patients had received chemotherapy or radiotherapy prior to surgery. Consent from all patients were obtained. Ovarian cancer was validated by histological examination in all cases according to World Health Organization criteria. Ovarian cancer and normal ovarian tissue specimens excised surgically from patients were immediately snap-frozen and stored in liquid nitrogen until use. This experiment was approved by ethic committee of the 2nd Affiliated Hospital of Harbin Medical University, and the tissues were acquired with the consent of patients. The short hairpin RNAs (shRNA CCAT1) were cloned into PLKO.1 vector. To make lentiviruses, the packaging vectors (pPAX2 and pVSVG) and PLKO. shRNAs were co-transfected into 293T cells. The supernatant was harvested at 48 h after transfection. For virus infection, the virus supernatant was added to medium at 1:5 ratio, after 24 h, 2 μg/ml puromycin was used to select the positive cells. Migration of cells were measured by a wound healing assay in vitro. Briefly, 2 × 105 SKOV3 or CaOV3 cells were seeded onto 6-well plates, with either sh-CCAT1 or sh-NC, and incubated in appropriate complete culture medium for 16 h under normoxic conditions at 37 °C. The monolayer was scratched and incubated in medium without FBS for 24 h. The wound width was measured after 24 h. Three different locations were visualized and photographed under inverted microscope. Invasion assay was performed using chambers with 8.0-μm pore membranes (Millipore). Ovarian cancer cells (1 × 105 cells) were resuspended in 200 µl of FBS-free medium, and then seeded into the top chamber with Matrigel-coated membrane. Next, 500 µl medium with 10% FBS was added to the bottom chamber as a chemoattractant. After 48 h of incubation, the invaded cells were fixed, stained with 0.005% crystal violet, and counted under the inverted microscope. CCAT1 or TGFβR1 mutant was generated using site-directed mutagenesis. Then, the sequence of the CCAT1 or TGFβR1 was cloned into the firefly luciferase-expressing vector pGL3-luciferase plasmid. As for luciferase assay, the SKOV3 or CaOV3 cells were seeded for triplicates in 24-well plates at the day before transfection, and co-transfected with the CCAT1 or TGFβR1 reporter vector and miR-490-3p. Then, the cells were harvested and lysed, and the luciferase activities were assayed using the Dual-Luciferase Reporter System (Promega). Three independent experiments were performed. The cells were harvested and washed with PBS buffer, then lysed by 1 × SDS loading buffer. The lysates were boiled at 100 °C for 5 min. The samples were centrifuged at 10,000 rpm for 1 min. Around 50 μg of total proteins was loaded onto SDS-PAGE gel and resolved. After that, the proteins were transferred to PVDF membrane at 300 mA for 1.5 h. The membrane was blocked with 5% non-fat milk in 1× TBST for 1 h at room temperature, the membrane was then incubated with primary antibodies at 4 °C overnight. The following day, the membrane was washed with 1× TBST for three times, 5 min each time. The membrane was incubated with secondary antibodies at room temperature for 1 h. Finally, the membrane was incubated with ECL solution and then exposed. The following antibodies were used: anti-TGFβR1 (cell signaling technology, USA), anti-E-cadherin (cell signaling technology, USA), anti-N-cadherin (cell signaling technology, USA), anti-Claudin (cell signaling technology, USA), anti-β-actin (Proteintech, USA), anti-MMP9 (Abcam, USA), anti-GAPDH (Proteintech, USA). We extracted the RNA using Trizol method. Cells were lysed by Trizol buffer and then add chloroform to the mixture. The sample was centrifuged at 12,000 rpm for 10 min and transferred to new EP tube, mixed with equivalent volume of isopropanol, next, the resultant was centrifuged at 12,000 rpm for 10 min. Removing the supernatant and add 75% ethanol to wash the pellet and centrifuge. Finally, discard the ethanol and dry the pellet, use 20–30 μl Rnase-free H2O to resolve the RNA. For reverse transcription, about 1 μg of total RNA was used for reverse transcription according to manufacturer instruction (TAKARA PrimeScript Kit). The expression of miR-490-3p was quantified by TaqMan miRNA assays (Applied Biosystems, Foster City, CA, USA). Each experiment was performed for three times, all values were presented as mean ± SD, comparison of two groups were performed using the two-tailed unpaired student’s t-test. One-way ANOVA was used for comparison among multiple groups and multiple comparisons were further performed using post hoc Turkey test. *P < 0.05 were considered statistically significant (*P < 0.05, **P < 0.01, and ***P < 0.001). To characterize the role of CCAT1 in TGFβ1-induced EMT of ovarian cancer cells, we first determined the expression level of CCAT1 in SKOV3 and CaOV3 cells when treated with 10 ng/ml TGFβ1 for 48 h. The result showed CCAT1 was upregulated by TGFβ1 (Fig. 1a). Next, we generated stable CCAT1-depleted SKOV3 and CaOV3 cells by shRNAs approach (Fig. 1b). And then we employed wound healing method to examine the migration of CCAT1-depleted ovarian cancer cells SKOV3 and CaOV3 in the presence of TGFβ1(10 ng/ml). The results showed that scramble (sh-NC) cells exhibited no migration difference compared to control, whereas CCAT1 knockdown (sh-CCAT1) cell significantly compromised migration (reduced by ~ 40–50%) of ovarian cancer cells induced by TGFβ1 in relative to sh-NC group (Fig. 1c, d). In addition, we sought to determine whether TGFβ1-induced invasion of ovarian cells were regulated by CCAT1 loss. Transwell matrix penetration assay demonstrated that knockdown of CCAT1 reduced the number of invasive ovarian cancer cells (by ~ 50%) in the presence of TGFβ1 compared to sh-NC group (Fig. 1e). 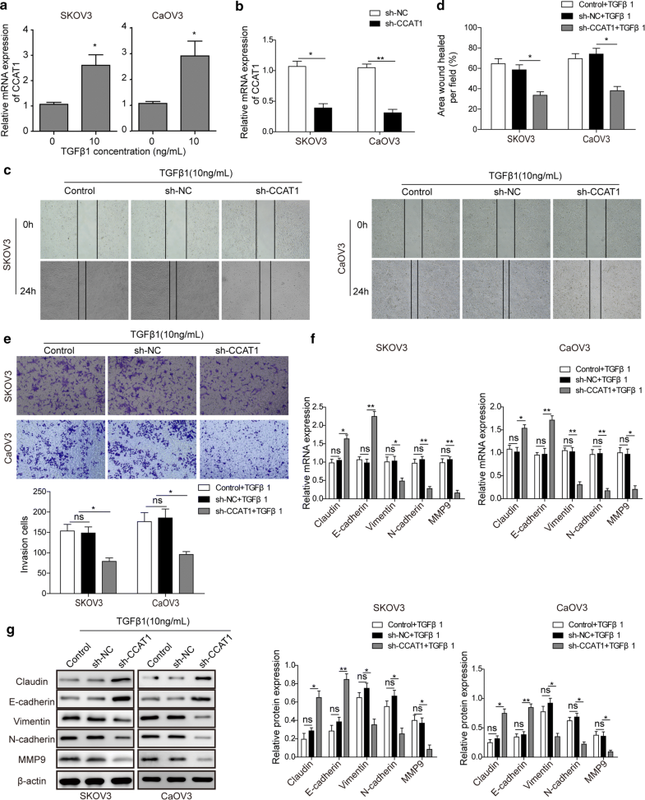 To further investigate the mechanism underlying TGFβ1-induced invasion and migration of ovarian cancer cells regulated by CCAT1, we examined the expression of EMT-associated genes in control and sh-CCAT1 ovarian cells. RT-qPCR and western blot analyses showed that CCAT1 knockdown markedly attenuated TGFβ1-induced expression of vimentin, N-cadherin and MMP9, on the other hand, CCAT1 knockdown enhanced TGFβ1-induced expression of E-cadherin and Claudin (Fig. 1f, g). Taken together, these results revealed that CCAT1 loss led to remarkably attenuated EMT of ovarian cancer cells treated with TGFβ1. In order to clarify the mechanism by which CCAT1 loss compromised TGFβ1-induced EMT, we hypothesized that TGFβ1 cognate receptor, TGFβR1, might be regulated by CCAT1. Interestingly, we observed that TGFβR1 mRNA level was diminished by about 50–70% in CCAT1-null cells compared to shNC cells (Fig. 2a). In agreement with this, protein level of TGFβR1 was also downregulated by CCAT1 depletion in both SKOV3 and CaOV3 cells (Fig. 2b). In sum, these data indicated that CCAT1 played its roles in TGFβ1-induced EMT of ovarian tumor through enhancing TGFβR1 expression. It has been reported that miR-490-3p has been implicated in ovarian tumor invasion and metastasis . We reasoned that CCAT1 might exert its role by regulating miR-490-3p in ovarian cancer cells. Bioinformatic analysis revealed that CCAT1 could directly target miR-490-3p by matching with sequence at 3′-terminus (Fig. 3a). Furthermore, luciferase reporter assay was used to confirm that CCAT1 directly interacted with miR-490-3p. We found that miR-490-3p overexpression only decreased wildtype CCAT1-fused luciferase activity, not CCAT1 mutant (Fig. 3b). Notably, miR-490-3p level was substantially upregulated by CCAT1 knockdown in SKOV3 and CaOV3 cells (Fig. 3c). 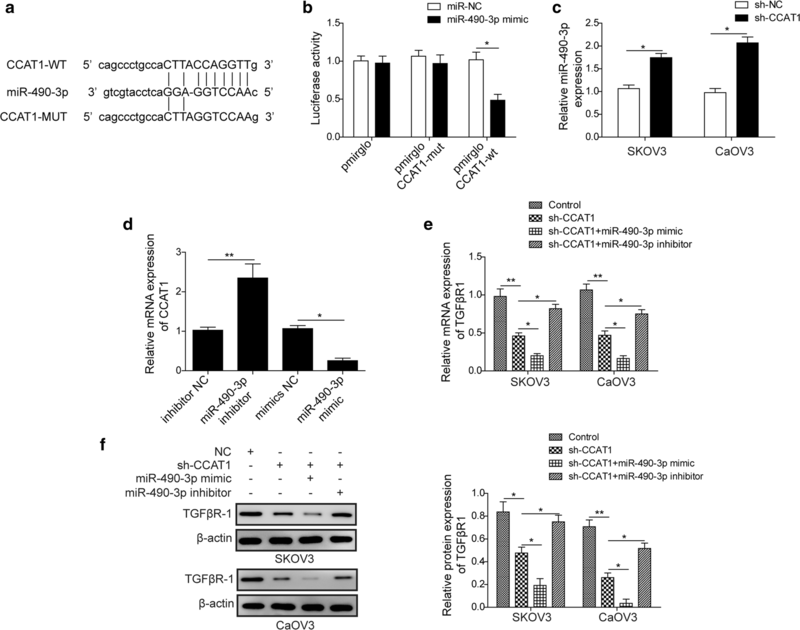 Moreover, miR-490-3p mimics suppressed CCAT1 expression, and instead miR-490-3p inhibitor enhanced CCAT1 expression of SKOV3 and CaOV3 cells (Fig. 3d). RT-qPCR and western blot analyses showed that miR-490-3p overexpression augmented CCAT1 depletion-induced TGFβR1 downregulation, while miR-490-3p inhibitor greatly restored the expression level of TGFβR1 (Fig. 3e, f). Together, these results suggested that lncRNA CCAT1 loss downregulated TGFβR1 expression via directly targeting miR-490-3p. As CCAT1 was shown to decrease miR-490-3p level, then upregulating TGFβR1 expression in SKOV3 and CaOV3 cells; therefore, we sought to assess whether miR-490-3p was essential for CCAT1-mediated tumor phenotypes of ovarian cancer cells. Wound healing assay showed that CCAT1 knockdown alone impaired (decreased by 52%) the ability of TGFβ1 to promote cells migration. Transfection of both miR-490-3p mimics and CCAT1 shRNA markedly attenuated (dropped by ~ 88%) migration of ovarian cancer cells relative to shCCAT1 alone, while co-transfection of miR-490-3p inhibitor and CCAT1 shRNA into cells exhibited more robust migration (increased by ~ 72%) than shCCAT1-expressing cells (Fig. 4a). Besides, we found that miR-490-3p mimics potentiated shCCAT1-inhibited invasiveness (the invasion cell number decreased by 60%) and instead miR-490-3p inhibitor attenuated (the invasived cell number increased by 61%) shCCAT1-inhibited invasiveness of SKOV3 and CaOV3 cells (Fig. 4b). As for EMT-associated markers, RT-qPCR and westernblot revealed that upregulation of E-cadherin and Claudin by CCAT1 loss was enhanced by miR-490-3p mimics and attenuated by miR-490-3p inhibitor in SKOV3 and CaOV3 cells, inverse in the expression of vimentin, N-cadherin and MMP9 (Fig. 4c, d). Collectively, these findings indicated that miR-490-3p was essential for TGFβ1-induced EMT of ovarian cancer cells regulated by CCAT1 depletion. To further explore how miR-490-3p affected CCAT1 loss-induced TGFβR1 expression, we inferred that miR-490-3p probably targeted TGFβR1 and regulated its expression. The bioinformatic analyses revealed that miR-490-3p could target 3′-UTR of TGFβR1 mRNA (Fig. 5a). Luciferase reporter assay demonstrated that miR-490-3p mimics effectively inhibited the activity in wildtype 3′-UTR of TGFβR1 cells, not the mutant, suggesting miR-490-3p played its role via directly binding 3′-UTR of TGFβR1 (Fig. 5b). To determine the biological function of miR-490-3p-induced TGFβR1 downregulation, we overexpressed miR-490-3p mimics alone or in combination with TGFβR1. The RT-qPCR and westernblot analyses showed TGFβR1 was reduced by miR-490-3p mimics overexpression; however, TGFβR1 level increased when the cells overexpressing miR-490-3p and TGFβR1 (Fig. 5c, d). Next, we observed that miR-490-3p overexpression greatly attenuated migration of ovarian cancer cells SKOV3 and CaOV3, whereas exogenous expression of miR-490-3p and TGFβR1 rescued TGFβ1-induced migration change of the cells (Fig. 5e, f). Similarly, miR-490-3p mimics caused remarkably decreased invasion of ovarian cancer cells compared to negative control, and transfection of miR-490-3p plus TGFβR1 could enhance the invasiveness of ovarian cancer cells comparable to control (Fig. 5f). Finally, we detected EMT-associated markers after overexpression of miR-490-3p and TGFβR1. Our results showed miR-490-3p inhibited TGFβ1-induced expression of vimentin, N-cadherin and MMP9, instead, upregulated TGFβ1-induced expression of E-cadherin and Claudin. 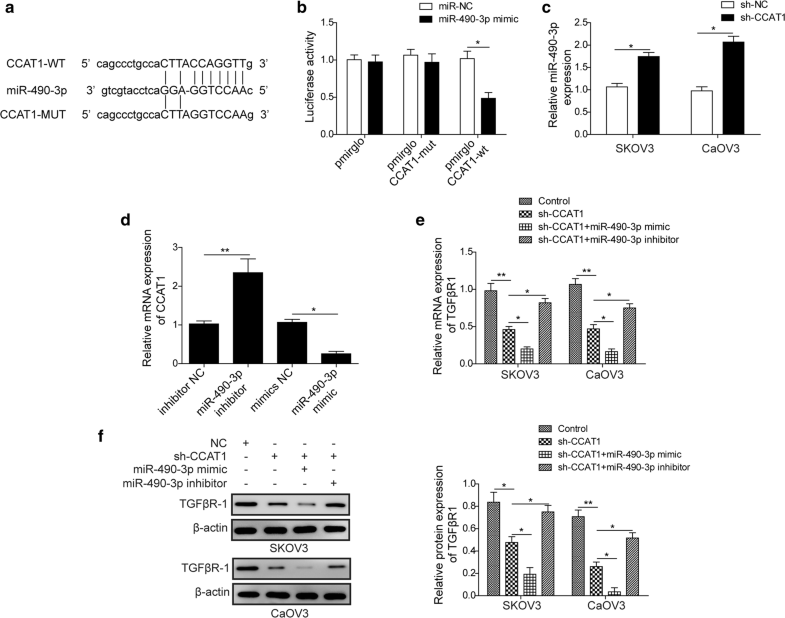 More importantly, overexpression of TGFβR1 reverted miR-490-3p-mediated regulation of EMT-related genes in ovarian cancer cells (Fig. 5g). To determine the clinical association of CCAT1 and miR-490-3p expression with progression of ovarian cancer, we examined CCAT1 and miR-490-3p expression level of ovarian tumors (n = 25) and adjacent normal tissues (n = 25) by RT-qPCR approach. CCAT1 level was higher (~ 2.6 folds) in tumors than in normal tissues; however, miR-490-3p level was lower (~ 65%) in tumors compared to normal tissues (Fig. 6a, b). In addition, the bioinformatic analysis showed negative association between CCAT1 and miR-490-3p expression in ovarian tumors (r2 = 0.8579, p < 0.01) (Fig. 6c). To summarize, our data indicated that CCAT1, clinically, might promote ovarian cancer via inhibiting expression of miR-490-3p. Ovarian cancer results in the death of about 140,000 women, and limited improvement of survival rate has been achieved in ovarian cancer . Most patients with ovarian cancer died from advanced stage (metastatic) of the cancer, other than early stage . Therefore, it is key to illuminate the mechanism underlying metastasis of ovarian cancer. In this study, our results demonstrated that lncRNA CCAT1 enhanced TGFβ1-induced metastatic process of ovarian cancer cells via miR-490-3p/TGFβR1 axis, which was crucial for developing targeted drugs for treating ovarian cancer patients with advanced stage. TGFβ1 signaling is important in a number of cellular processes, physiologically and pathologically . And it is believed that TGFβ1 switches its suppressive role in normal cells into tumor-stimulatory role in cancer cells. Such as, TGFβ1 could induce EMT and metastasis of human ovarian cancer cells . More interestingly, TGFβ1 could modulate EMT by impacting expression of lncRNAs and miRNAs in gastric cancer and bladder cancer. For example, TGFβ1-induced LncRNA UCA1 upregulation promotes gastric cancer invasion and migration . In addition, TGFβ1 secreted by cancer-associated fibroblasts induces EMT of bladder cancer cells through lncRNA-ZEB2NAT . In this study, we first proved that TGFβ1 upregulated expression of lncRNACCAT1 in ovarian cancer cells and knockdown of CCAT1 inhibited TGFβ1-induced EMT. Moreover, consistent with previous studies LncRNA CCAT1 promotes EMT of intrahepatic cholangiocarcinoma . In addition, it was reported that LncRNA CCAT1 promoted EMT of epithelial ovarian cancer cells via miR-152/miR-130-Zeb1 axis . All these revealed that TGFβ1 induced EMT of ovarian cancer partly dependent on lncRNACCAT1. Emerging evidence has revealed that lncRNAs exert its effects as competing endogenous RNA (ceRNA) . In the case, lncRNAs commonly interact with miRNAs and mutually regulate each other’s expression. LncRNAs function as ceRNAs to target and degrade miRNAs; however, miRNAs suppress lncRNA through an Argonaute 2-mediated pathway [36, 37]. In the previous report, it was found that CCAT1 is a driver of malignancy, which acts in part through ‘sponging’ miRNA-218-5p in gallbladder cancer . It was also found that CCAT1 could target and sponge miR-152 in ovarian cancer cells . In this study, we found that CCAT1 function as ceRNA to directly bind and decline miR-490-3p via complementary sequence. Consistent with the reports that the long noncoding RNA colon cancer-associated transcript-1/miR-490 axis regulates gastric cancer cell migration by targeting hnRNPA1 . MiR-490-3p has been reported to act as oncosuppressive microRNA to inhibit breast cancer tumorigenesis and progression by targeting RhoA directly . Importantly, miR-490-3p may target CDK1 and inhibit ovarian epithelial carcinoma tumorigenesis and progression . Consistent with these results, functionally, we observed that miR-490-3p overexpression led to attenuated migration and invasion, and regulated EMT-associated genes (vimentin, N-cadherin, E-cadherin and Claudin). These data imply that knockdown CCAT1 inhibited TGFβ1-induced EMT in ovarain cancer cells through sponging miR-490-3p. Xuehu Xu et al. observed that miR-490-3p targeted TGFβR1 to inhibit colorectal cancer metastasis . Consistently, our results revealed that miR-490-3p suppressed TGFβR1 expression and TGFβR1 overexpression could rescue miR-490-3p-inhibited EMT. J Xiang et al. reported that TGFβR1 promoted EMT of gastric cancer treated with TGFβ, which was attenuated by Grhl2 . Besides, 14-3-3/TGFβR1 axis also promoted tumor metastasis in lung squamous carcinoma . Hence, these conclusions further support our notion described above. Here, our results demonstrated that lncRNA CCAT1 enhanced TGFβ1-induced metastatic process of ovarian cancer cells via miR-490-3p/TGFβR1 axis in ovarian cancer cells. This new molecular axis was confirmed to be important for TGFβ1-induced EMT of ovarian cancer; however, other possible mechanisms responsible for CCAT1-mediated metastasis of ovarian cancer cells remains to be investigated for the future. Our findings shed lights on how CCAT1 regulates TGFβ1-promoted cancer metastasis and facilitate development of effective therapies for treating ovarian cancer. Guarantor of integrity of the entire study: CYL, study concepts: MY, study design: CYL, definition of intellectual content: MY, literature research: MY, clinical studies: MY, experimental studies: MY, data acquisition: LN, data analysis: LN, statistical analysis: MY, manuscript preparation: MY, manuscript editing: CYL, manuscript review: CYL. All authors read and approved the final manuscript. One-way ANOVA was used for comparison among multiple groups and multiple comparisons were further performed using post hoc Turkey test. All authors agree to submit this manuscript and declare no competing of interest related to this work. This experiment was approved by ethic committee of the 2nd Affiliated Hospital of Harbin Medical University, and the tissues were acquired with the consent of patients.